Naples in Italy is a great Cruise Destination! Its surroundings offer many beautiful shore excursions for cruise passenger that are well worth seeing. As your Cruise Ship enters Molo Beverello Harbour, you can already see from far the outlines of the Vesuvius, and a beautiful panorama of Napoli and the Sorrentine Peninsula opens up in front of you. If you prefer exploring a city on your own rather than joining an organized tour, Naples is the right place for you. Many interesting sights can be reached on foot or by using public transit. You can also take a cab or the bus at the harbour, but sometimes there is pretty heavy traffic, so the Funicolare or the subway (Metro or Metropolitana) is a better choice. But of course you can also plan hourly or daily excursions to Pompeii, Sorrento, Capri or the Amalfi Coast, if you have enough time (at least 5 hours). Routes A, B, and C leave from Piazza Plebiscito at the Largo Castello (Maschio Angioino) in red double-decker busses and offer sightseeing tours in different languages with different topics (for example views on the Gulf or art locations). The tours are about 75 – 110 min long and include up to 12 stops. It’s possible to book the sightseeing tours online. Maschio Angioino – Piazza Plebiscito – Palazzo Reale – Caffé Gambrinus – Galleria Umberto – Via Toledo – Via Chiaia – Castell dell’Ovo. When you walk past it and keep left, you reach the Piazza Plebiscito with the Palazzo Reale (King’s Palace), the famous Caffé Gambrinus, and the beautiful Galleria Umberto I (about 15 min to walk). 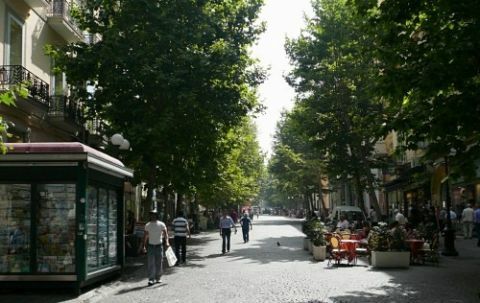 For those of you who like shopping, walk from Piazza Plebiscito towards the long shopping street, Via Toledo, (pedestrian area) with lots of boutiques and shoe stores. It leads all the way to the lively Piazza Dante. If you would like to see more exclusive boutiques, you might want to go to the pretty Via Chiaia, which starts at the Caffé Gambrinus. Should you, however, prefer to stroll towards the sea, you walk from Piazza Plebiscito to Castell dell’Ovo (about 20-30 min from the harbour). 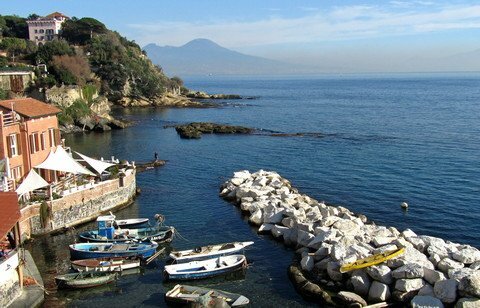 There, at the small marina Santa Lucia, you can find very good restaurants and caffés from where you have a great view on Mount Vesuvius. On Piazza Municipio you can take the subway, which brings you to the higher situated quarter of Vomero in 5 min (Piazza Vanvitelli). From there, you walk 10 min until you reach the beautiful San Martino Castle that offers fantastic views on the whole city and the Vesuvius. The Vomero has also a pedestrian area with many stores and boutiques. In the characteristic historic city of Naples with its winding alleyways und laundry that flutters in the wind, you can still sense the spirit of the true Naples. Via San Gregorio Armeno is the well-known street of the nativity scene makers, where numerous craftspeople sell Neapolitan nativity scenes and figurines. Many chapels and churches are awaiting your visit and, afterwards, you can take a welcome break in the gardens of the monastery Santa Chiara. It takes about 30 min to reach the historic city on foot. But you can also get the metro from Piazza Municipio to Piazza Dante, take a cab to Piazza Gesù, or take the bus. The world-famous National Archaeological Museum in Naples impresses its visitors especially with numerous findings from Pompeii, the colourful mosaics, and the Erotica collection. The fastest way from the Harbour to the museum is taking the Metro (subway) from Piazza Municipio to “Museo” Station. You’ll be there in about 10 min. Oftentimes, we get inquiries regarding beautiful sandy beaches in the city of Naples. Unfortunately, there are only a few small and often very busy sections directly in the city. The nicest (though smallest) sandy beaches are in Posillipo, a beautiful quarter of Naples, where you can also find lidos (“Lidi”), which are naturally very busy during the summer. The larger sandy beaches in the vicinity are, for example, in Meta di Sorrento on the Sorrentine Peninsula, which can be reached with the train Circumvesuviana from the main station at Piazza Garibaldi in about 50 min. Of course, you can also take a ferry and enjoy a swim in the sea on Ischia.